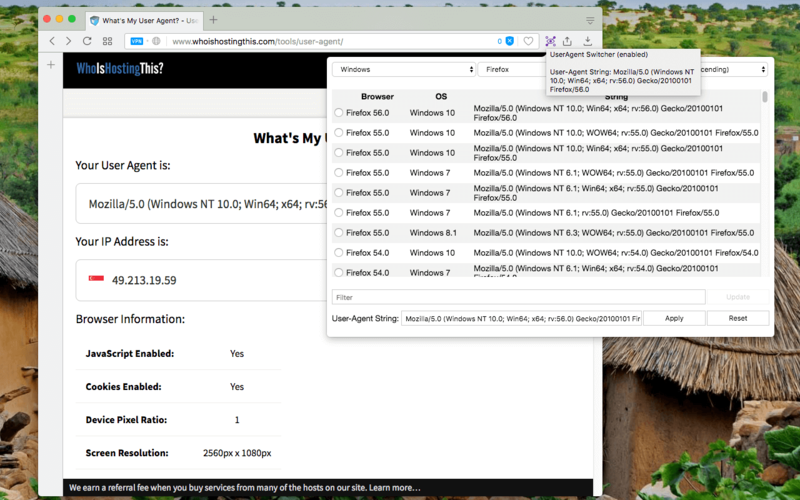 What is "User-Agent Switcher" extension and how does it work? Note: When the extension is not active (disabled from the toolbar popup by pressing the "Reset" button), there is no network monitor and hence extension does not use any resource. Note: This extension only alters "User-Agent" string for "HTTP://", "HTTPS://" and "FTP://" schemes. So locally loaded HTML pages with "FILE://" scheme can pass the extension's protective script and will display your actual "User-Agent" string (there is no security or privacy concern as this type of pages cannot send any request to an actual web server). How can I set a custom or pre-defined "User-Agent" string? After installing the extension, a toolbar button is added to your browser. Simply open the popup by pressing the toolbar button. Wait until all "User-Agent" strings are loaded (this may take a few seconds). You can filter the strings by "Browser" type or by "Operating System". Also, you can use the "custom" filtering box to find matching strings. When a "User-Agent" string is selected from the list, it will be inserted in the provided text-box where you can edit its content. When the content looks good, press the "Apply" button. Sometimes, new versions of the "User-Agent" strings for a particular browser is not on the list. Can I manually set it? Yes, simply paste the string in the provided text box in the popup and press the "Apply" button. How can I reset the "User-Agent" string back to the default one? Open the toolbar popup and press the reset button. You will notice the color of the toolbar will change. Also, the tooltip is tagged with the "disabled" label. What is my current "User-Agent" string? To find the currently used "User-Agent" string hover your mouse pointer over the toolbar button. The string and enable or disable status is displayed in the tooltip. Although the extension is active, still in the incognito mode, my actual "User-Agent" string is displayed. How can I fix this? Go to the extension manager and allow this extension to work on the incognito mode. Can I apply user-agent string spoofing only for certain domains? As of version 0.1.3, it is possible to have "white-list", "black-list", or "custom" modes of operation. In the "black-list" mode, the custom user-agent string is set for all tabs except the ones that are listed on the options page. In the "white-list" mode, however, the user-agent string is only set for those tabs that their hostname matches with one of the hostnames listed in the options page. In the "custom" mode, user-agent string is resolved from the user-defined JSON object. If there is a key in the JSON object with the hostname, then user-agent will be the value of this key, otherwise, the user-agent string will be the default user-agent string of your browser or the one that is set from the toolbar popup. What is the meaning of the "custom" mode and how can I use it? In the custom mode, the extension uses user-defined JSON object to match user-agent strings. If the provided JSON object has a key that is equal to the top-level hostname (e.g. : www.google.com), the value of that key is used as the user-agent string for all the requested originated from this hostname. If no key is found, the extension ignores the tab which means the default user-agent string or the one that is set in the popup is used. What is the meaning of the "window" button in the toolbar popup? As of version 0.2.4, you can define a user-agent string for the current window only. This means that all other browser windows will use the global setting except the current window. This may help you organize your work better. Note that you can have as many user-agent strings per-window as you want. To reset the window-based UA settings use the "Restart" button in the toolbar popup. This button basically restarts the extension and hence all the temporarily settings are wiped. So the window based settings is not a permanent setting (there is no way to find a window when a browser is restarted). It works until all the tabs in the window are closed or the extension gets reloaded. To differentiate the window with a defined user-agent string, this extension adds a badge notification to the toolbar area. For the users of black- and white-list modes, please read the options page to make sure how the black- and white-lists are affected by the newly introduced window-based user-agent string setting. Can I set the empty user-agent string? Use the "empty" keyword as the user-agent string since blank input is not a valid entry. The extension will use the empty string when this keyword is used. This extension doesn't seem to support wildcard matching. How can I set a user-agent string for both top domain and all its sub-domains? Is there a way to easily switch between different modes (black-list, white-list, and custom modes)? Use the right-click context menu over the toolbar button to switch between different modes. For instance, if you use the custom mode, then to temporarily disabling the extension, switch to the default black-list mode.